Lake Roosevelt is the name of the Columbia River reservoir behind Grand Coulee Dam. It is named for Franklin Delano Roosevelt, who as president authorized the initial construction of the dam and remained its champion as long as he was president. Depending on how full it is, the reservoir reaches upriver about 150 miles. It averages 4,000 feet in width and 375 feet in depth. When full (elevation 1,290 feet above sea level at the dam), Lake Roosevelt impounds 9 million acre-feet (11.1 billion cubic meters) of water. That amount would cover a land mass the size of the state of Washington (71,303 square miles, or 184,674 square kilometers) with 2.3 inches of water. The Spokane and Colville Indian reservations border on the lake. Outside of the reservations, the shoreline is managed by the National Park Service as the Lake Roosevelt National Recreation Area. This recreation area encompasses approximately 100,400 acres (40,630 hectares). The Park Service has managed the area since 1946. Lake Roosevelt provides water storage for flood control and hydropower generation at Grand Coulee and at dams downriver, but it also is something of a playground for public fishing and boating. Three fish hatcheries, two of them operated by the tribes and a third operated by the Washington Department of Fish and Wildlife, produce trout and kokanee for the popular sport fishery in the lake. More than 30 species of fish are found in the lake. The hatcheries release more than 500,000 rainbow trout and 500,000 kokanee into the lake each year. Some of the fish incubated at the tribal hatcheries are reared and released at a series of floating net pens in the lake that are operated by volunteers. The level of the lake is dictated by hydropower and flood control operations. The maximum elevation of the lake is 1,290 feet (393 meters) above sea level, and the minimum is 1,208 feet (368 meters). Thus the lake level can fluctuate by 82 vertical feet (25 meters). In most years, the lake is drawn down in the fall and winter in anticipation of the spring and early-summer runoff, and allowed to refill to full, or within about 10 feet of full, by the end of June. The Bureau of Reclamation, which operates Grand Coulee Dam, adjusts the level of the lake in coordination with other federal agencies that operate dams downstream, Canadian entities that operate dams upriver, and the two federal fish and wildlife agencies that implement the Endangered Species Act for salmon, steelhead and bull trout. White sturgeon in the upper reaches of the lake also are affected by the fluctuating water level. Lake Roosevelt provides irrigation water for the Columbia Basin Project, which is managed by the Bureau of Reclamation. The project includes more than 670,000 (271,139 hectares) acres of the Columbia Plateau south of Grand Coulee. About 2.5 million acre-feet (30.8 billion cubic meters) of water are pumped from Lake Roosevelt to irrigate crops in the project area each year. Public recreation, such as fishing, boating, and camping, is an important economic activity. At full pool, the lake has more than 600 miles (965 kilometers) of shoreline, and much of it is within the National Recreation Area managed by the park service. The Colville Tribe also operates a houseboat rental business on the lake that is popular with summer tourists. Recreational activities take place along the length of the lake despite concerns about water quality, which has deteriorated over time as the result of pollution. One of the chief sources of long-term pollution in the lake is a large smelter at Trail, B.C., on the Columbia River a few miles north of the border. For decades the smelter discharged untreated waste products that included dangerous levels of heavy metals and chemical. These settled downriver in the United States and affected water quality and fish. The Colville Confederated Tribes have raised awareness of the pollution dangers to humans and fish; the U.S. Environmental Protection Agency and the smelter owner, Teck Cominco, have attempted to negotiate a cleanup agreement. The recreational potential of the lake long has been recognized. In his 1949 book, The Columbia: Powerhouse of the West, Murray Morgan wrote about Lake Roosevelt in superlatives. Murray calculated that if all of the water in the lake were divided evenly among all Americans at the time, each would receive an amount equivalent to two-and-a-half railroad tank cars. He wrote that the advocates of Grand Coulee Dam predicted Lake Roosevelt would “. . .be developed into an all-year playground with sailing, swimming and hiking alternating with skating, ice-boating and skiing.” He wrote that the lake “. . .does offer wonderful sailing, and in winter becomes a tremendous rink bordered by pleasant ski slopes.” But he also noted the predicted developments had not taken place. In tones reminiscent of a guide book, he said the lake scenery was magnificent and that a good three-course dinner could be had for eighty-five cents and a pleasant hotel room for two dollars. He described the shore as an almost never-ending campsite backed by dry brown hills incised with creeks, many of them dry in the summer, and green water lapping at bunch grass. The place was ideal, he proclaimed, for the “sleeping-bag tourist.” The confluence of the Spokane River, once a feared place because of its rapids, had been turned into a quiet lake by the reservoir, a confluence now as placid as the meeting of two Dutch canals, he said. Over time the lake did develop as a tourist destination, if not to the extent Morgan envisioned. 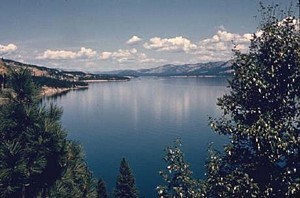 In 1980, the Park Service counted 800,000 visitors to the lake. By 2000 that number had nearly doubled, and the number is expected to continue grow in future years. Lake Roosevelt Recreation Area. Photo: WDFW.